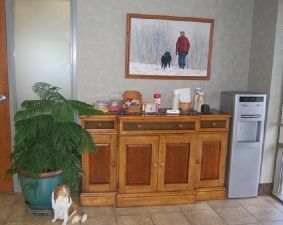 Short wait times are a priority even though our lobby is spacious and comfortable. Be sure to check out the "Cozy Coffee Corner" for coffee, hot chocolate, tea and cookies. 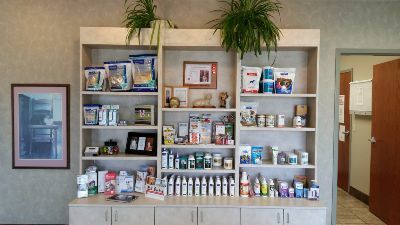 We dispense a wide variety of Prescription pet foods. We also carry medicated shampoos and rinses, and many different dental care products. Our knowledgeable staff is more than happy to discuss any of these products with you. We also maintain a complete inventory of pharmaceuticals, vitamins, heartworm and parasite preventatives to meet the needs of your pet.